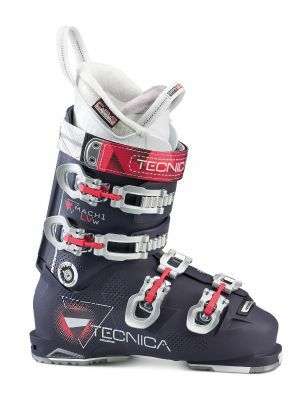 Description: For intermediate to advanced women with wider and higher volume feet, the Atomic Hawx Magna 90 Ski Boots is a great option. For those who need even more width, the Hawx Magna 90 also has Atomic's new Memory Fit shell technology, which lets you heat mold the boot to conform to your unique foot shape. 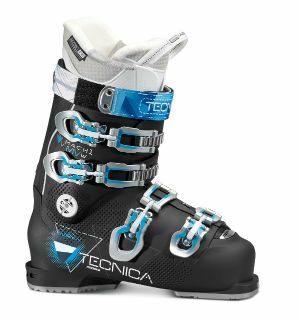 Description: The Hawx Magna 80 W is one of Atomics' new wide-fit Hawx Magna ski boot series. This series means for the first time ever you can get the legendary Hawx feel and features in a boot with a 102mm fit!. It’s the lightest boot in its class and packed with features purpose-built for wider feet like the easy step-in zone and a wide tongue. It has a soft flex for intermediate skiers. The Silver Liner also features 3M™ Thinsulate™ Platinum Insulation to keep your feet warm and responsive even in extremely cold and damp conditions. Description: The AVANTI 95 ID is a high performance model for advanced to expert women skiers featuring high tech good looks and innovative architecture. Dalbello’s “Fit for Women” construction combines a unique 99 mm Contour4 shell last with lower cuff profile fit and Center Balanced “Rocker” Stance to encourage natural balance and to improve ski feel for better control with less fatigue. Optional ID Thermo Pro-Fit Innerboot Fit System is custom heat moldable, warm and lightweight. Description: The Avanti 85 IF is for athletic and ambitious all mountain women skiers who take their ski boot performance seriously. Powerful and precise with exceptional comfort and foothold, unique “Fit for Women” features and Center Balanced “Rocker” Stance. Ski with more control and greater comfort than you ever thought possible. The Avanti 85 IF comes equipped with custom heat moldable IF Performer innerboots that are super lightweight, warm and precise. Description: The Avanti 75 IF is for athletic and ambitious all mountain women skiers who take their ski boot performance seriously. Powerful and precise with exceptional comfort and foothold, unique “Fit for Women” features and Center Balanced “Rocker” Stance. Ski with more control and greater comfort than you ever thought possible. The Avanti 85 IF comes equipped with custom heat moldable IF Sport innerboots that are super lightweight, warm and precise. Description: Developed for intermediate to advanced all mountain skiers, the Luna 90 is exceptionally easy to put on and take off with high tech functionality for improved walking and comfort. Description: The high-performance boot for women: comfortable and effective thanks to VACUUM FIT and Ultralon boot liner. Description: Sporty partner for women: this boot is easy to adapt thanks to VACUUM and ensures a good fit and sporty, comfortable ski days as a result. With insulated boot liner for warm toes. Description: The Cruzar is a new comfort model which is very easy to put on. Its Ski/Walk Mode gives you even more comfort both on the piste and on your way to it. Easy to shape thanks to VACUUM. Description: Head have engineered the Adapt Edge 95 W to deliver good skiers versatility in both fit and ski zones access. Crammed with customizable tech, including our exclusive width adjustment Adaptive Fit Technology, Women’s Perfect Fit HP Liner, fine-tuneable Double Power Buckles and Stiffer/softer flex adjustment. Description: Customizability, comfort and ease of use define the AdaptEdge 85W, providing comfortable all-day ski performance to advanced riders. Includes a fleece lining for added warmth and 100% conformable Women’s Perfect Fit HP liner. Description: The SpYre 110 ski boot, featuring a low volume 97mm last, is the most aggressive, highest performing, stiffest ski boot in the K2 Women's collection. Bootfitters' Comments: The Spyre 100 ranks at the top of its category. Its flex is stiff enough for advanced and expert skiers without being too burly for aspiring chargers. Suitable for a variety of foot and leg shapes. This boot shows a quick, powerful characterat all speeds and through a variety of snow and terrain. Description: A great all-mountain boot. Easy to fit, completely adjustable, with the kind of on-snow control sport skiers used to only dream of, the NXT boot is also a cinch to get on and off. Description: Twinframe technology ensures that Xmax 90 W delivers superior transmission and power, with customized comfort for all day skiing. Women's specific fit and customizable shell in the calf area for supreme comfort. Description: All-mountain performance, light weight, and Salomon's revolutionary 3D liner come together in the X-Pro 80 W, with women's specific fit and performance features. Description: Designed specifically for advanced, expert or professional female skiers looking for a traditional 4 buckle, all mountain boot, the Mach1 105W is perfect for someone that doesn’t want to compromise performance but is looking for a slightly relaxed women's specific fit. Bootfitters' Comments: The Mach105 has an athletic, balanced stance, appropriately firm 105 flex feel and strong lateral power combined to drive the ski's edge with authority, rendering a more aggressive line easily accomplished.The Mach1 fits many different feet well, but particularly suits higher volume feet. Description: The Mach1 95 W LV’s unbeatable features and fit make it a perfect choice for intermediate to advanced women with a lower volume foot who are looking for a comfortable yet uncompromising fit. Description: Mach1 85W is perfect for the intermediate to advanced skier that is looking for the women's specific fit and performance of a Mach1, but is coupled with a more comfort oriented, women’s QuadraFit liner.